When you’re moving, it can often seem like you have entered survival mode. All you are concentrating on is getting your life from point a to point b, and very little else. This mindset is necessary to a degree, but it can also complicate things. If you don’t pay close attention to your belongings and how you are moving them, you may arrive with a bunch of dusty, damaged items that weren’t that way when you started packing. 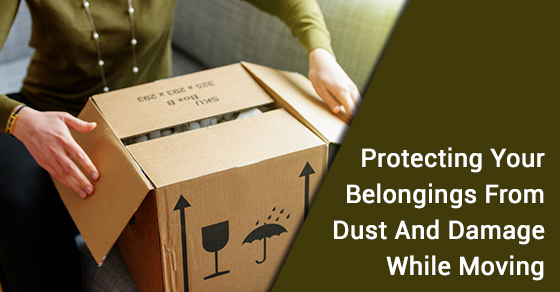 Below are some tips on how to protect your items from dust and damage when moving. The best way to protect your valuables during a move is to know what and where those valuable are. Before even beginning to pack, make a checklist of what your valuables are and what boxes they are going to go in. Once you start throwing things in boxes, if you are not properly accounting for them and labelling them, you might end up forgetting what went in which box. The best way to ensure that your belongings are well looked after while you are moving, especially those which you want to move individually, and probably move last, is to keep them off site. That means investing in a self storage unit where you can tuck certain items away that you will then move once you’ve taken everything else from the old place to the new place. Options like climate control, drive up storage options, and round the clock security make self storage units one of your best options. One of the best preventative measures you can take while moving is to invest in sturdy new boxes that are not going to crumble under the weight of other boxes. For electronics, the best bet is to use the box that the product came in (i.e. the manufacturer’s box), because it was especially designed to be able to stand up to intercontinental journeys, whether by air or by sea. Moving should be something that you approach methodically and with intent. Knowing what you are going to store beforehand and potentially place in a self storage unit, and knowing where all your valuable items are at all times, is the best plan of attack. Keeping things well sealed, and using the best boxes for the job, is a must.